A roadside rest area is an unusual place to find a wall mural, but I came across this in Florida last week and thought it was worth a mention. In this case, they were selling all the places you might want to go in the Everglades. 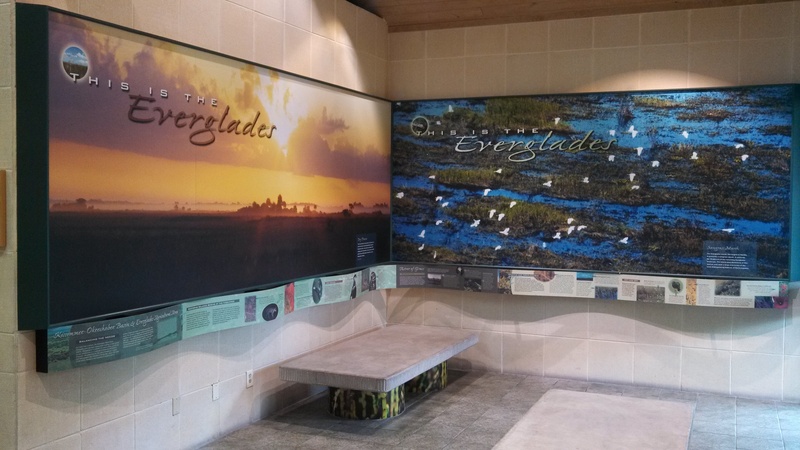 They had a beauty shot of the Everglades and a map of the attractions. If you were there on vacation, it made you stop and want to learn more! Best of all, this is the kind of thing that can be done inexpensively. If we were printing the two 6×15′ murals, we would charge about $1200. That’s a pretty cheap way of doing a very striking display! This entry was posted in Custom Printed Wallpaper and tagged custom wallpaper, custom wallpaper murals, promotional wallpaper, rest area wallpaper. Bookmark the permalink.